Paul Exben has everything that he ever wanted - a wife he adores, a young son he worships, a beautiful home and a successful career as a lawyer. So why then does he feel frustrated and unfulfilled? While Paul struggles within the confines of his privileged life, he begins to suspect that his wife is having an affair. She denies this when questioned but Paul is unconvinced and sets out to discover the truth. Little does he know that this journey will end in tragedy and force him to run from his perfect life and everyone that he loves. The central premise of The Big Picture is to take a normal man and put him in an extraordinary situation. How will he cope? What will he do? I think that you are supposed to feel sorry for Paul and his predicament but, while I did sympathise to a certain extent, if I am honest I found him so annoying.This made it hard for me to invest emotion in his situation. That is not to say that this is a bad movie or that I didn’t enjoy it - more that I enjoyed parts of it while other parts just frustrated me. The story moves along at a rapid pace. It is pretty inventive and there are several moments when the tension is high. I kept wondering how he was going to get out of each, increasingly difficult, situation. However, I also felt that the plot had gaping holes and things happened that just didn’t make sense or ring true. Never Miss A Review! 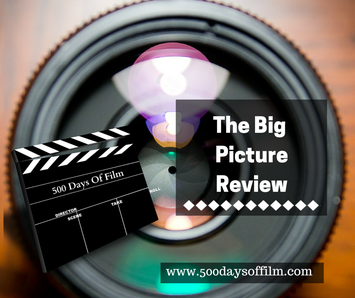 Join The 500 Days Of Film Club! This film is based on a Douglas Kennedy book of the same name. I have not read this book but I am told that the ending of the film is quite different. How gorgeous is Paul’s perfect home? Also Paul’s hair really annoyed me… not sure why. Rant over!